Have you noticed the number of people in the internet marketing community talking about outsourcing? I wouldn’t exactly call it the latest buzz word, because it’s something that has been widely adopted as “leveraging your time” for quite a few years now, but the concept is definitely becoming more and more talked about. It seems as though everybody knows about it, and a lot of people have tried it, but very few are successful at it. I think this is primarily because a lot of “internet marketers” haven’t come from a high end management job or position that required them to manage a team so they lack a lot of fundamental skills needed to actually manage other people effectively. 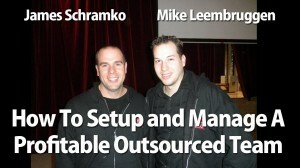 One person that has successfully put together a highly productive team of outsourcers is James Schramko. James came from a high end management position at Mercedes Benz where he was required to manage up to 100 people at one time. He has excellent management skills which has obviously helped him grow his online business to a 7 figure per year income in just 2 years. I’ve been picking up on a few of the things James has said about the way his team works and his approach is very different to the way the internet marketing community has taught how to outsource in the past. James was kind enough to let me interview him on exactly how he has managed to grow his team, establish a great camaraderie between his workers, and basically put together an effective system where he only needs to chat with his team for 5 minutes each day. It’s truly amazing what he has accomplished and I get new inspiration and knowledge from James every time we chat. I hope you enjoy the interview below… and let me know if this interview was helpful to you by leaving your comments. Mike Leembruggen is available for consulting, contracting, and tech implementation. Mike lives and breathes 'internet marketing' and has a passion for building automated systems and marketing funnels that convert into big dollars. If you would like to speak to Mike, please send him a quick message through one of the contact forms on this site.